Quiet, wounded in body and soul and angry at the Charr, Gwen has suffered hardships but has tried to keep her dreams alive. She now makes her home among the Ebon Vanguard in the Eye of the North, where she practices and hones her skills as a Mesmer. Gwen has been known to make sarcastic commentary, and to be defensive upon meeting new people. Though she really is a sweetheart in the longrun, Gwen initially comes off as a bitter personality. Also, her reputation among the Ebon Vanguard causes some to fear her. She only uses her skills when she is in combat, however, and tries to establish whether someone (or something) is going to be a threat before becoming offensive and unleashing her abilities. Gwen is a mesmer, so she has mastery over the powers of illusion. When hasty and angered, she WILL use her powers; but, as with Anita, her powers HAVE been significantly weakened, and would physically exhaust her to use. Goblimon looks up to Gwen as some sort of an idol. While he doesn't outwardly show how much he idolizes her, he does show tendencies of being somewhat of a 'squire,' always supportive of her and always at her side, waiting for her to ask him to do something. He'd go to great lengths for her, this being shown by how exhausted he became with searching for food while they were stuck in Meria. At first, Gwen doesn't think much of Goblimon, but eventually warms up to him, and begins to treat him more like her partner and confidante, if not her friend. Born and Raised in Ascalon, Gwen was a happy child who liked to skip around, follow random people, red iris flowers and playing her flute. Her mother was a monk, and Gwen was in-between herself, wanting to be like her mother, yet wanting to do her own thing. Gwen's happy childhood, however, was short-lived. The Charr, enemies of the country of Tyria and humans in general, had finally been successful in wiping out the heart of Tyria, Ascalon city. When the searing of Ascalon occured, Gwen was captured and enslaved by the Charr. She managed to escape, and she fled to the north, finding other humans like herself. 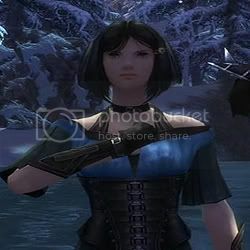 Gwen joined the Ebon Vanguard, and now, serving under Captain Langmar, she is said to be one of the fiercest defenders of Ascalon, determined to get her revenge on the ones who took her home and her family away from her. Her profession is a mesmer; she is skilled in the art of illusion, and does have the power to drain health from people. Katrina Daniels: Katrina was the first person Gwen met in the digital world, and continues to be one of her best friends. Katrina was the one who helped her out the most when she was just beginning her adventures in this strange new world, and was also the one who helped Lillithmon stamp the seal of lust on her. Despite this, however, Gwen slowly finds herself getting more and more attached to Katrina, seal or not; and this, among other things, scares her a little bit. Sister Anita Dalton: Gwen worked with Anita back in their world, after Anita agreed to help her seek out the missing Ebon Vanguard members. Because of Anita's magnetic personality, she became relatively good friends with her and is grateful for her help in finding her other missing comrades.